I turned around. Standing there was a blond-haired man. He was good-looking, but he also looked like such a sleazy skirt-chaser it ruined the whole impression. Two daggers were dangling on his hips. Event? Magic stone? Were they players, then? I slightly raised my vigilance and moved back half a step. That got him flustered. He waved his hands and stepped back. I played dumb in an attempt to glean some information. But… wait a minute? I thought the beta players could distinguish between NPCs and players? Well, whatever. For some reason, he seemed interested in my face. He continued his explanation while constantly sneaking glances at my hooded head. Supposedly, their group thought Tiz’s bounty was a game event. They also possessed the [Red Magic Stone] they got from killing another one of us in that event. 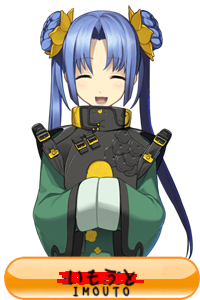 And since they knew the ‘rabbit beastman girl’ stole the yellow magic stone, they were planning to use theirs as bait to lure me out. Weed stared in shock, alternating his gaze between me and a spot slightly to the upper-left of me. This again? Yes, yes, I got it, now could you please stop looking at my face? Weed began his excuse, which was then overwhelmed by Sally’s own… wait, actually Sally sounded a lot like Salia. So easy to mix up. Both of them continued their incomprehensible-to-NPCs rants. The powerful adventurer – Isaac, was it? – deeply sighed and turned to me. “I heard you’re baiting the ‘rabbit’ in the bounty?” I asked. They really weren’t very vigilant at all in front of NPCs, were they? Isaac’s been ignoring me, until his friends finally pointed out his own mistake. I nodded. Isaac seemed to have finally shaken off his hesitation. He spoke up for both me and his comrades to hear. Apparently Isaac had decided to bring me along under his employ. Why? “Whoa, for real? Hell yeah!” Weed cheered. “Sally, too loud. What if she talk to other adventurers, and then they come to mess things up? We’re bringing her along to keep it secret from the normal adventurers,” Isaac replied. Looked like they never even entertained the possibility that NPCs could refuse. Can’t be helped, I supposed. If anything, this was actually better for me. I didn’t know what sort of event they were going to set up, but as long as I could get my hands on the red magic stone, it’d be fine. …it was No. 08’s stone, right? Should be. Otherwise I’d be so screwed. According to Isaac, the event would be one week later. He had already notified his friends (through the internet). Anyone who could come was welcomed to. It would be held at their base, in the outskirts of the Free City of Seis. They showed me the spot on the simple map posted inside the guild hall. It was hella far away. It was a large country on the eastern end of the central continent. I wondered how we were going to get there in just a week. Isaac explained. First off, the group would go by slow rail to a nearby large country called Battrol, switching trains along the way. This would take four days. Then once we were there, we’d take the airship. This was the first time I’d ever heard of airships. According to them, only the large countries had the necessary airports, and you could go to any other large country in the world in just one to two days with it. Until Battrol, we’d just be riding normal trains, not express. They said they were here to earn some money in the first place. Wasting large gold coins for a quick ride would just be defeating the purpose. We got on the cheapest train we could find. A bit tight, but still we managed to find a four-person room. We finally had time for proper introductions. The group composed of Isaac the warrior, Weed the speedy fighter, and Sandrea the magician. Of course, I wasn’t naive enough to use my real name here. The fake name wasn’t all that different, since I needed to be able to respond to it quickly enough if someone called me. For some reason, Sandrea pushed her beaming smile right next to my face after hearing my greeting. I really didn’t want to confuse her with silly Salia. And before I knew it, my insistence had already prompted Isaac and Weed to start calling her Sandrea too. She was appalled. Miss Sandrea. I can hear you whispering “Dumbass AI…” over there. Whisper quieter. “What will you do about food?” I asked. Isaac elbow-jabbed Weed for his careless words. On the train, I still went and bought food (for Blobsy’s consumption) from the cafeteria to keep up the ruse. On the other hand, despite being inside a train car, the group sometimes disappeared. So they were logging out to eat, then. There were times when Sandrea disappeared for a whole twelve hours, even times when only one of them remained in the game. Weed was mostly here. He was here too often. I worried for his real life. He was constantly, annoyingly attempting to start up conversations, plus his eyes actually felt kind of dangerous, so I shut him down every time he started talking. Then, once in a while, he would stop moving and stared into empty air. A closer look revealed that his lips were barely moving. Maybe he was chatting with someone somewhere. Honestly, were they even trying to fool me? I supposed that in the end, this was just a game to them, and I was just an NPC. After seeing me unresponsive to anything meta, they kept getting more and more careless, and their logout times became more and more frequent. It wasn’t really a problem for me, since I had no plans to make friends with them. All the same, even when they knew the NPCs here were acting just like real living people, they still wasn’t treating me as one. Even until now. …I could see this causing all sorts of issues. Good luck, game moderators. Not like it’s my problem though. And on the day before we reached Battrol’s first station, the three of them finally logged out at the same time. It seemed they’d been grinding their magic skills on the train, but it wasn’t enough to distract themselves from the boredom. As they disappeared, I noticed a strange pool of mana on the floor. It had a protecting barrier. It was probably marking the spot for their subsequent login. I carefully tested out a bit of [Cyber-Manipulation] on it, subtle enough that the corporation wouldn’t find out. As I did, I got a response similar to my [Packer] skill. After some deeper snooping, I found some equipment that could be accessed through my own [Packer] skill. They looked like they belonged to the three. This was a welcome surprise. Even if I couldn’t take them out, it might still be possible to play a bit of a prank. An hour before the train reached the first station, the three finally reappeared. Sandrea and Weed immediately crowded the window. They had completely turned into gawking tourists now, entranced by the view of farmlands, villages, and the approaching town. Only Isaac was still in his seat. He seemed concerned, seeing me staying so still. Too late, now. I was neither a player, nor a native of this world. I had become something in between. The moment that corporation betrayed all one hundred of us, players were no longer our allies. Fourteen days of borrowed time left. I could see the end of the line. Better be prepared, you three. Sooner or later, you’ll become my meal. Author’s Note: I heard the old meme “How do I delete you?” that used to be popular back in the day actually gets an answer nowadays. When players died, they dropped their equipment on the ground, except for event items. As mentioned in the story, the logout spot will be marked, and their items would be stored inside it. Then why were players not allowed to use [Packer] normally? Because maintaining the marked storage requires a bit of mana. Generally, the chance of players recovering their items were low, so for the purpose of economizing mana use, the game developers decided to remove the ability entirely. 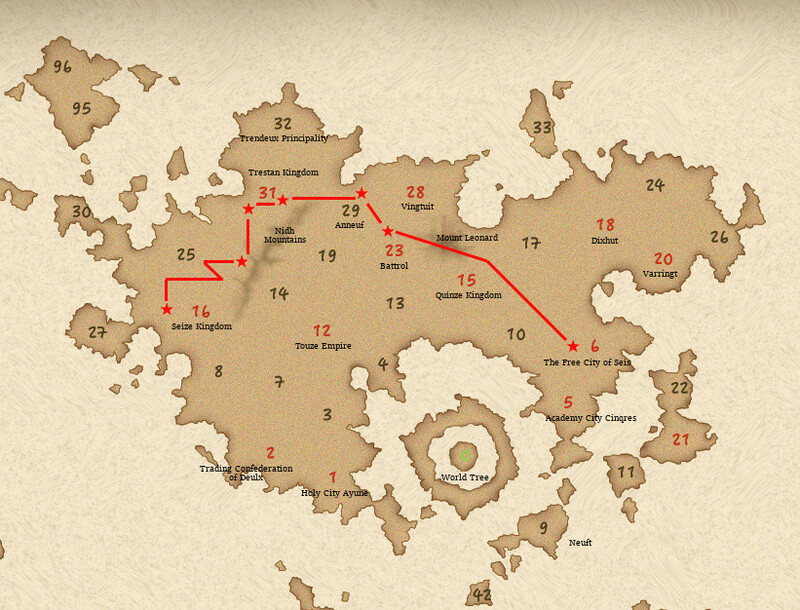 Below is the travel path for this chapter and the next. There are some slight adjustments to the path Shedy’s taken until now, mainly because of time and date reasons. Translator’s Note: Bigger sized map here. Author’s note refers to a Japanese meme. Over in Japan, Microsoft Office didn’t used to have Clippy, they had a dolphin called Kairu instead. Which was still annoying as all hell. So when the dolphin asked “What do you want to know?”, a lot of users would type in “How do I delete you?” Newer versions these days actually have the dolphin respond to that message now, and it’ll tell you how to turn itself off while looking super sad. Sorry, people. My access to computers are spotty these days. The next few updates might be irregular. Chapter 30’s “Next Page” doesn’t link to 31. I had to use email alert link to get here. Why the hell did someone like this? Are they masochists? Delays due to irl are not a subjct of likability! An update on why irregular releases coming up is always nice instead of just going cold turkey. So, those three are MREs? This series is one of my favorites, can’t wait for the next one. I can’t stop look for New chapter every days ! Though I do wonder how they want to trap someone who was last seen half a continent away? Even if this were a game the NPCs seem to travel with the same speed as players, by foot, train or air ship. Given that the bounty is for a beast man (likely traveling slower than a train) and not a mist monster (traveling like the wind?) setting the trap closer to the last seen place would be more logical. Vidya logic, they think she’ll just spawn there. I read 2 chapters, and the thing that stood out the most was actually the authors note at the end of this chapter. I had completely forgotten about clippy, I think a large part of the reason why I forgot was I had left school by the time it was gotten rid of. During college and beyond, most my office work was done using Open Office and simply saving in the relevant format usually 97 or 2003 edition for compatibility. Even though I now use Microsoft Office at work, it’s been that long since I had used it that even the ribbon layout feels foreign to me, even now I still don’t like it after a few years of use. So such a gimmick naturally was forgotten and ignored. Though I think I might bring up with others when I’m back in work next week. I’m of the opinion that infodumping, if ever done, should always be done from the point of view of a character. Yeah, I agree with that. Still, the author’s notes are relevant, so I have no choice but to include them. Wanted to request that people stop using imgur… it stopped being a decent service years ago.